The InterContinental Hotel Chicago is family friendly luxury right in the heart of downtown. 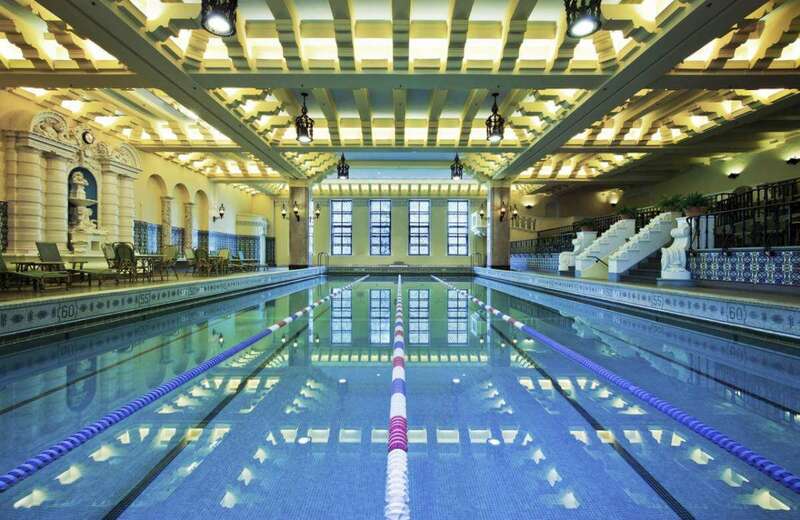 Originally built as a men’s athletic club in 1929, the hotel was purchased by InterContinental Hotels in 1988 who immediately set to renovating while maintaining the building’s historical character. When visitors step into the four story lobby, they are instantly transported to a place of luxury and glamour. With doors that lead directly out to Michigan Avenue, the hotel is accessible to anything you could want in the city. Families desiring an upscale hotel with friendly staff, spacious and luxurious rooms, and a top notch location will not be disappointed by the InterContinental Hotel Chicago. 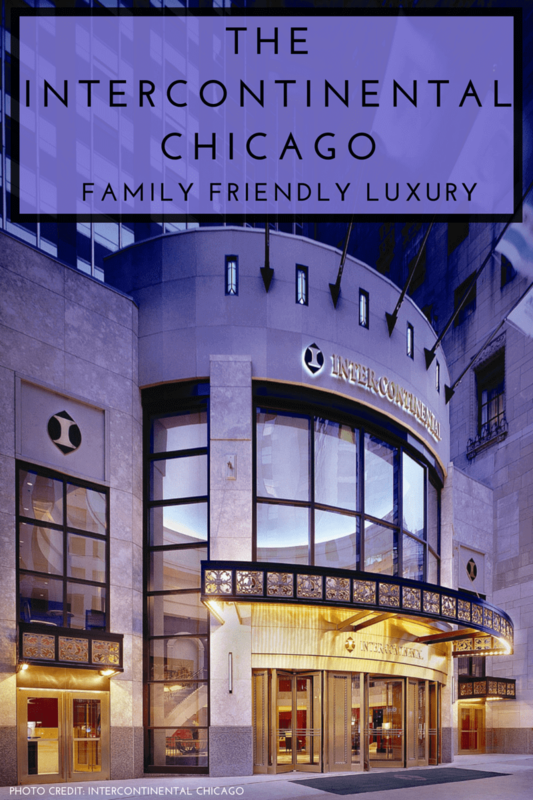 I recently had the opportunity to visit the InterContinental Hotel Chicago as part of #TNTChicago, an event co-hosted by TravelingMom and Techlicious. Most of you know I work for TravelingMom, but Techlicious is a company we work with on TNT (Technology N Travel) events around the country. We have speakers come in and share information about technology, travel, and usually a few other exciting topics. The InterContinental Hotel hosted the event (along with CEA and Hasbro) and showed us their recently renovated rooms in their executive tower. I must say, everyone in the tour group was extremely impressed by how spacious the rooms are. (I loved the fact some overlook Michigan Avenue). There is definitely a lot of space for families to spread out. 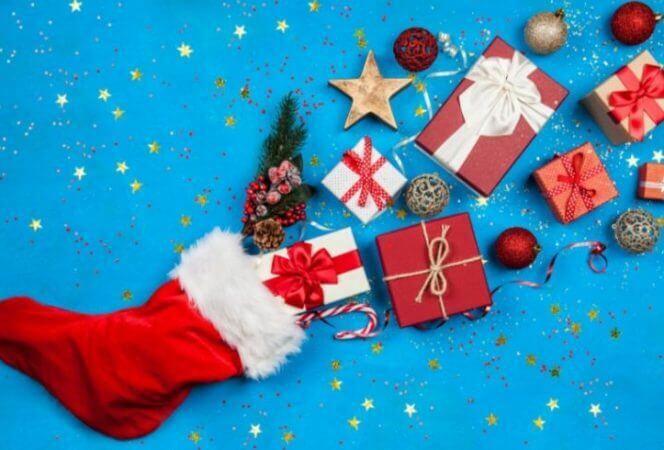 The hotel also offers many packages geared toward families, including a Family Fun Package and an American Girl Package. The location cannot be beat. It is right in the middle of the action. Next door is Dylan’s Candy Bar for the kids, and there’s a Starbucks in the building for mom and dad. Do I need to go on? One block to the Chicago River, four blocks to Millennium Park, four blocks to Navy Pier. I honestly love this location. 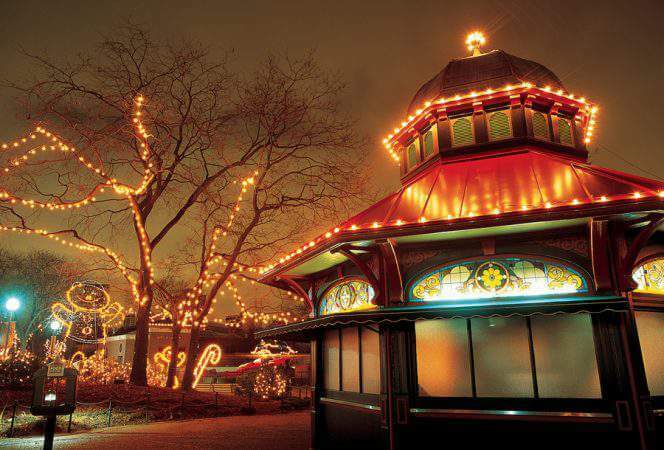 There is a free shuttle service between the hotel and Navy Pier. No taxis or public transportation needed. There are many quality food options nearby. 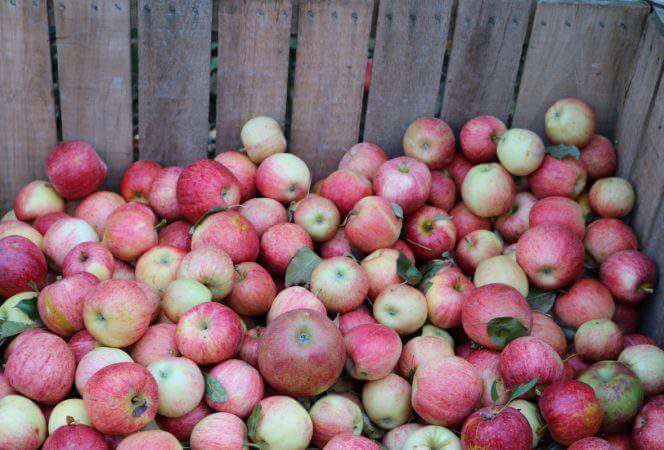 There are sit down and carry out restaurants, diners, cafés, and grocery stores. It makes it easy to find something to fit everyone’s tastes for breakfast, lunch, and dinner. There is a swimming pool. Not just any swimming pool, a majestic, historic pool surrounded by marble columns and blue tiles, with stained glass windows and an elevated seating area. The seating area used to be where the women would sit and watch their men swim in the pool. The pool is straight out of a Hollywood movie! The staff throughout the property was extremely helpful and friendly. A big shout out to Will the doorman who has worked at the hotel for 22 years! He is the most helpful, friendly, patient, genuine person I have ever met. Put a smile on my face (and many others) when we were there. There are several room options for families. In the Grand Tower, rooms can easily accommodate up to two adults, and two children. In their Executive Tower, rooms can accommodate larger families with their two beds and rollaway couch options. Any place that can fit my family of five scores big points with me. Maybe it’s just me and the fact that I’m used to staying at “family friendly” hotels, but the pool doesn’t scream “kid friendly”. Again, maybe it’s because we visited in the morning and the pool was roped off while there were gentlemen swimming laps. I’m not saying my kids wouldn’t go swimming in the pool, but they might have disturbed the other guests. Breakfast options. The hotel does have packages where you can include breakfast with your stay, but in this day and age, so many families want breakfast included. Period. There is a restaurant onsite, The Continental, that serves breakfast, but you do have to pay for it if you haven’t purchased it as part of your room package. Parking. This is more of a warning than anything. It will be expensive. It is expensive anywhere you park in downtown Chicago. It is not an InterContinental problem, it is a city problem. My advice to you is to leave the car at home and take public transportation or walk. Wi fi. One of my friends who stayed at the hotel said the wi fi wasn’t reliable. The connection dropped several times which she said was frustrating. The hotel was originally built as the Medinah Athletic Club, a men’s only luxury club for members of the Shriner’s Organization in 1929. The club was financially devastated by the fall of the stock market and forced to close its doors in 1934. In 1988 it was purchased by InterContinental Hotels, who set about renovating the building. They recently completely a renovation of their Executive Tower, with elegant European style decor featuring oversized baths with Italian marble and larger rooms with varying configurations. The InterContinental has an ideal Chicago location, situated on the famed “Magnificent Mile”, within walking distance of attractions, shopping, entertainment, and restaurants. There are 792 guest rooms, including 75 suites. The hotel has two towers, the Grand Tower and The Executive Tower. 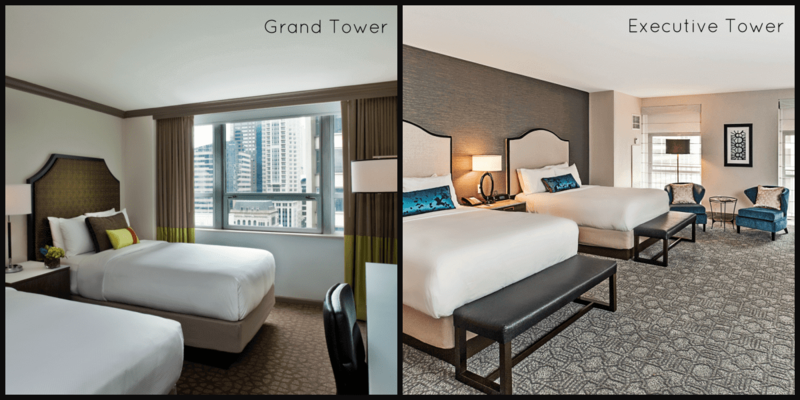 The Grand Tower has rooms with contemporary, classic decor and the newly renovated Executive Tower rooms are more European in style, with clean lines. They are opulent, yet refined. Rooms have mini bars, coffee makers, and 32″ flat panel televisions. The beds in the Executive Tower feature super comfortable (per my friend that stayed there) Serta Presidential Beds, down-filled duvet, and 350-thread count linens. The rooms are large, but the furniture is plain and simple. The bathrooms in the Executive Tower are very spacious, and nicely decorated. 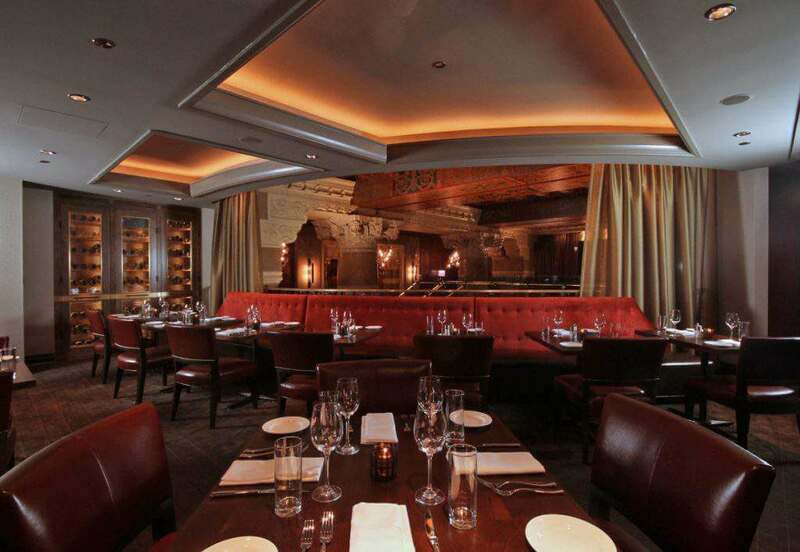 Michael Jordan’s Steakhouse – fine dining, lunch and dinner. The Continental – contemporary dining, this is their breakfast restaurant. Eno – wine bar looking out onto Michigan Avenue. There is also a Starbucks and room service. As I mentioned, I was an outsider looking in, and didn’t get to stay in the hotel, but I would recommend this to my friends without reservation. The InterContinental Chicago has so many positives, families won’t be disappointed if they choose this hotel as their home base. Want to see inside a room? Check out Traveling Mom Kim Orlando’s video! *Disclosure: I was not financially compensated for this post. I did receive free services including lunch and parking as part of the #TNTChicago event. The opinions are completely my own based on my experience.